Born: 1850, Felsted, Essex, England. Died: 10 April 1907, Kroonstad, Free State, South Africa. Edmond Symonds, son of Reverend George E. Symonds, Rector of Thaxted, Essex, was born either in 1850 or in 1853. He studied medicine at University College, London, and qualified as a Member of the Royal College of Surgeons (MRCS) of England in 1875 and as a Licentiate of the Royal College of Physicians (LRCP) of London in 1877. For the next two years he worked as a ship's surgeon for the Eastern Telegraph Company and practiced briefly in association with Dr H. Grace. He emigrated to the Orange Free State (now the Free State) in 1879 and was licensed to practice in the Cape Colony (and hence in the Orange Free State) on 3 November 1879. He settled in Kroonstad, where he remained until his death 28 years later. For most of that period (1881-1901) he was district surgeon. During the Anglo-Boer War (1899-1902) he was in charge of the Boer Ambulance Corps in the vicinity of Ladysmith for six months. 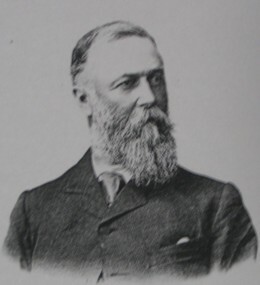 From 1882 to about 1903 he was a member of the Town Council, a position he gave up to become medical officer of health for the municipality. By 1898 he was a member of the (second) South African Medical Association. In 1884 he married Fanny T. Archbell, with whom he had five daughters. Symonds was an enthusiastic naturalist and a most hospitable host who delighted in showing his guests the bird life along the Vals River at Kroonstad. He was a friend and correspondent of the British ornithologist J.H. Gurney and a corresponding member of the British Ornithologists' Union and the Zoological Gardens of London. In 1887 he published "Notes on a collection of birds from Kroonstad, in the Orange Free State", including notes by Gurney, in The Ibis. That same year he contributed "Notes on some species of South African snakes" to the Proceedings of the Zoological Society of London. Over the years he presented many specimens to the Transvaal Museum and to its zoological gardens. Later he was an active member of the South African Ornithologists' Union (founded in 1904), contributing three articles to its Journal: "Notes on some migratory visitants to Kroonstad, Orange River Colony" (1906, Vol. 2, pp. 24-27), "Notes on some members of the family Ploceidae occurring in the Kroonstad district" (1906, Vol. 2, pp. 27-29), and "Some additional notes on the birds of the Kroonstad district" (1907, Vol. 3, pp. 42-51). At the Union's annual meeting during the first half of 1907 he was elected joint vice-president. He was also an early member of the South African Association for the Advancement of Science. Symonds died of a stroke after a short illness, having attended to his practice until the day before his death. Medical and pharmacy register of the Cape of Good Hope, 1893, 1907. National Automated Archival Information Retrieval System (NAAIRS). . Documents relating to Symonds, Edmund / Symonds, E.
Obituary: Dr Edmond Symonds. Journal of the South African Ornithologists' Union, 1907, Vol. 3(1), pp. 167-168. Obituary: Edmond Symonds, MRCS, LRCP. South African Medical Record, 1907, Vol. 5, p. 125. South African Medical Journal (series 2), January 1898, Vol. 5, pp. 240-242: South African Medical Association (list of members). South African Ornithologists' Union. Journal, 1906-1907, Vol. 2-3.